There is only one occasion in life when acquiring wisdom can be detrimental to your wellness; and that’s when your wisdom teeth emerge. These third molars can cause a host of problems. Thus, it’s typically necessary to undergo wisdom teeth extractions in Colorado Springs. Read on to learn about the problems these teeth can cause and when they should generally be removed. The reason that it is typically recommended to remove wisdom teeth is that when they emerge, they can become impacted, which means the tooth doesn’t fully break through the gum tissue. Because of this, bacteria can more easily penetrate beneath the gums to cause a painful infection. Additionally, the wisdom tooth can be more vulnerable to decay because it is harder to reach with a toothbrush and dental floss. When Should the Wisdom Tooth be Removed? Wisdom teeth usually emerge between the ages of 17 and 25, but the timeframe can vary for each person. Thus, it’s important to maintain regular visits with a dentist so the tooth can be monitored. The professional will be able to recognize any signs of future problems and refer you to a periodontist for an extraction if it is deemed necessary. Simple Extraction – A simple extraction involves a periodontist administering local anesthesia and then using a tool called an elevator to loosen the tooth so it can be easily removed. 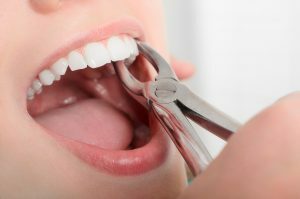 Surgical Extraction – More involved extractions, where a tooth is partially broken or impacted, may require a surgical procedure to complete. In such cases, IV sedation may be used to allow for a more comfortable process. Once the tooth is successfully extracted, the next step is to create the best environment possible for recovery. Thus, smoking or chewing tobacco should be avoided to prevent a painful condition called dry socket, which either halts the formation of a blood clot or causes it to fail, either of which can slow the healing process. It’s also important to avoid performing oral hygiene in the treatment area for the first 24 to 48 hours after the procedure is completed. This will allow time for your soft tissue to heal. If you suspect an emerging or existing wisdom tooth needs to be extracted, then contact your periodontist in Colorado Springs to schedule a visit today. Dr. Karl Lackler received his Master of Science in Periodontics from the University of Texas Health Sciences Center in San Antonio. Considered an expert in his field, he has taught at the postdoctoral level, and he has also been published in several peer review journals. Dr. Lackler maintains professional affiliation with the American Academy of Periodontology, and he has earned Diplomate status with the American Board of Periodontics. He extracts wisdom teeth at Rocky Mountain Periodontal Specialists, and he can be reached for more information through his website.